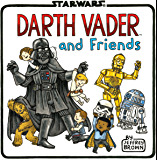 "With titles like this, as well as his "Star Warsbooks which focus on Darth Vader as a doting father raising his two young children Luke and Leia, Brown has proven adept at examining all the charming aspects of fatherhood, particularly with young children. It's a gift that has turned into significant success for the veteran cartoonist, as his latest work has all been very well received." 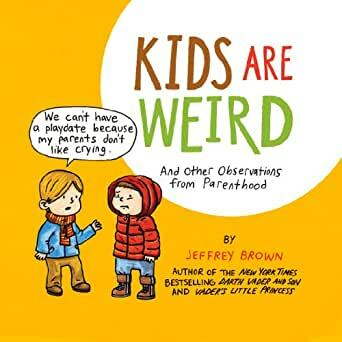 "A perfect book for Mother's Day, Father's Day, expectant parents, or even kids themselves, Kids Are Weird is a fun journey through the mind of a five-year-old boy." "With titles like this, as well as his Star Warsbooks which focus on Darth Vader as a doting father raising his two young children Luke and Leia, Brown has proven adept at examining all the charming aspects of fatherhood, particularly with young children. It's a gift that has turned into significant success for the veteran cartoonist, as his latest work has all been very well received." "Whether Mom is into graphic novels and comic books or not doesn't matter when it comes to Jeffrey Brown's work. His adorably simple line work and stories are infectious for anyone that enjoys quirky humor and poignant tales. 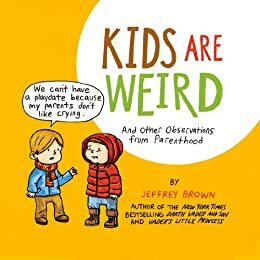 From the bestselling author of Darth Vader and Son and Vader's Little Princess, Kids Are Weird And Other Observations from Parenthood is another fantastic entry in the author's ongoing discovery of the oddly universal truths about family and parenting." Reading this as a grandparent of a 5 year old and remembering my own years as a parent of pre-schoolers (some 35 years ago!) was a lot of fun. There are enough comments and reactions that fit my experiences as well as others that were just funny. Not sure why the Dad is portrayed as a stubbled-covered (word?) adult but maybe that is the way kids see male grownups. Good, quick read. 4.0 out of 5 starsand this book captures some really good one! 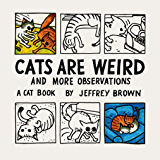 KIds ARE weird, and this book captures some really good one ! My son loves it. He is 6. He read this for his bedtime story.